The purpose of this cleaning marble floor article is to provide our readers with a troubleshooting guide and hints to identify and correct common and even less common problems and issues with marble and stone floors. When cleaning marble floor, the key to a stain free marble floor tile is to remove the stain or soil as soon as possible. This will eliminate the majority of the problems of staining the marble or stone floor.A new innovation – “That’s Amazing” Cleaning Pad from Unichem Marketing, Inc. has hit the market for cleaning marble floors and other stone surfaces. It is soft and a green cleaning product that will deliver high quality results without risk of damage of marble. Further information on how to contact Unichem Marketing, Inc. for “That’s Amazing” Pad is at the bottom of this article. As described in prior articles on cleaning marble floor tiles, marble is extremely porous and can readily accept stains. 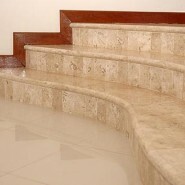 There is several ways to assist in reducing the chance of damaging marble floors during the cleaning process. If you are interested in how to clean marble floor for commercial daily cleaning, please click on the link for a prior article written on this topic (Cleaning Marble Floors – Commercial–Steps for Daily Cleaning Unsealed Marble)or for residential marble routine floor cleaning please review a prior article by clicking on this link (How to Clean Marble Floors – Routine or Daily Cleaning – Residential).